Near Earth Objects (NEOs) are small solar system bodies whose orbits sometimes bring them close to the Earth, thereby posing a potential threat. Because NEOs are constantly being replenished from the solar system, they are tracers of the composition, dynamics and environmental conditions throughout the solar system, and of the history of our planetary system. NEOs are the parent bodies of meteorites, one of our key sources of detailed knowledge about the solar system's development. NEOs are also potential targets for NASA missions. They are easier to reach with spacecraft than the moon, and NEOs offer a large number of targets with a wide range of physical properties and histories. 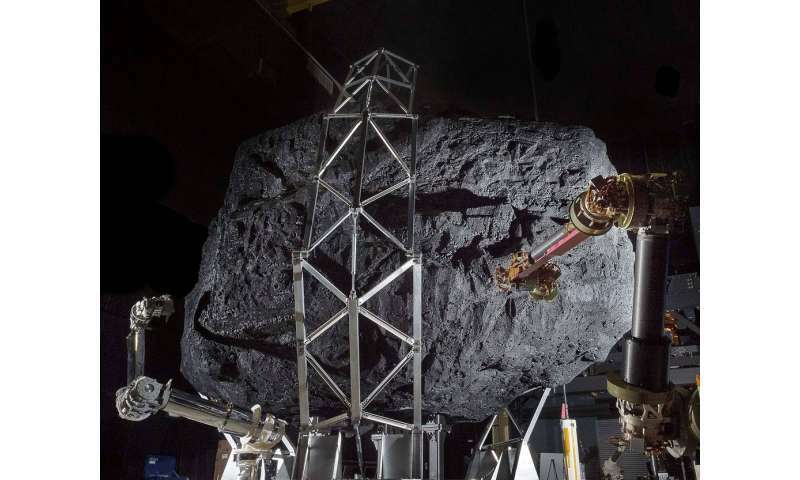 NASA's exploration plans for the next decade and beyond include an Asteroid Retrieval Mission. While it is relatively easy to detect an NEO in visible light by watching its movement across the sky from night to night, determining its size and its potential hazard is more difficult because its optical brightness results from both its size and its reflectivity (albedo). The Spitzer Space Telescope's infrared camera, IRAC, is a powerful NEO characterization system because NEOs typically have daytime temperatures around room temperature and their emitted radiation in the infrared is almost always significantly larger than their reflected radiation. Thermal models of the radiation can then be used to derive NEO properties, in particular the sizes and albedos. CfA astronomers Joe Hora, Giovanni Fazio and Howard Smith and their colleagues have been using IRAC for several years to study NEOs. A new paper presents their results for eighty NEOs, the first group from a larger sample of 597 NEOs that will eventually be measured and categorized. The strength of their sample derives in part from the fact that IRAC is very sensitive and can observe sources that are as much as one hundred times fainter than those seen in other infrared studies. The scientists report that the properties of this initial sample of NEOs agree closely with those of previous measured, brighter NEOs. Among other things, they find that for some NEOs as much as 29% of their infrared light is reflected, but in most cases only 1% is reflected, perhaps representing differences in the NEO compositions. Their analysis includes statistical comparisons to estimate the relative contributions of factors like non-isotropic radiation from geometrical or surface properties. The team also monitors some light curve variations as the NEO rotates, but defers that analysis to a later publication. Their program will ultimately include results from other missions to provides a list of 2000 characterized NEOs.